Trading activities on the floor of the Nigerian Stock Exchange on Friday closed in green as the All Share Index grew further by 0.31% to close at 31,529.92 points from the previous close of 31,433.49 points on Thursday. Market capitalisation grew by 0.31% to close at N11.758 trillion against the previous close of N11.722 trillion, thereby gaining N36 billion. Volume and value of traded stocks grew by 65.72% and 107.63%, closing at 723.8 million units and N12.2 billion respectively. The market breadth closed positive as 34 stocks gained, while 11 stocks declined in price. NPF Microfinance Bank and University Press among other gainers grew 8.39% and 8.33% of their share prices respectively. Interlinked Technologies Plc tops the losers’ table, shedding 10% of its share price to close at N3.24 against the previous close of N3.60. 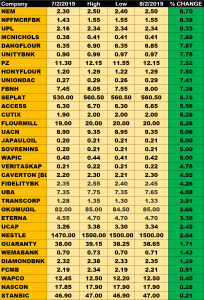 Etranzact and Consolidated Hallmark Insurance Plc among others on the decliners’ list also shed 9.85% and 6.90% of their share prices respectively.